More than a thousand years before the birth of Christ, an embittered, aging woman and her faithful daughter-in-law find themselves widowed and destitute in a foreign nation. Sounds like the beginnings of an intriguing story—and it is!—but what do the lives of these two courageous women have to teach us today? 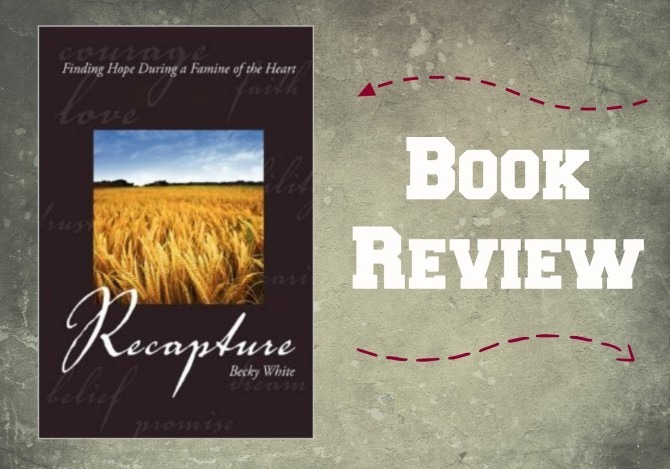 Becky White, author of Recapture: Finding Hope During a Famine of the Heart, uses the story of these two widows (found in the Biblical book of Ruth) to model powerful messages of courage, hope, and faith for the modern reader. I first encountered Becky two years ago at a women’s conference held at Forest Home Christian camp. Becky was the retreat coordinator and host of our weekend conference, and I was immediately drawn to her compassionate spirit and enthusiasm for the Lord. 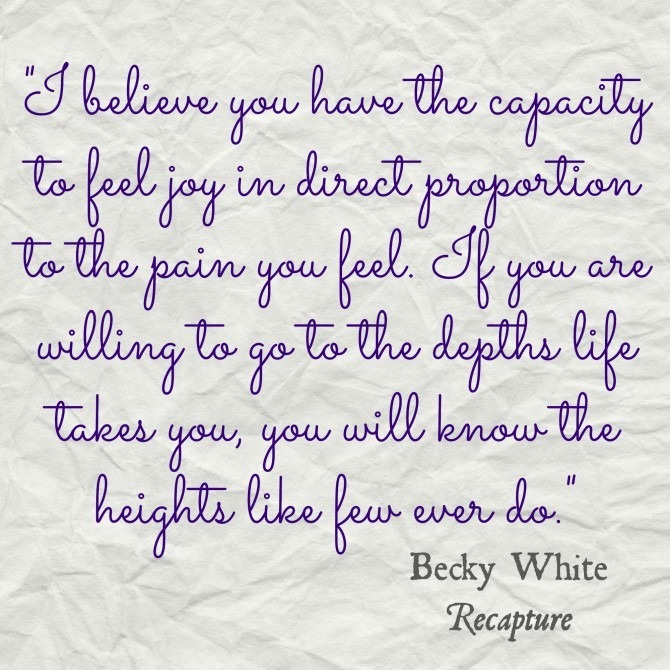 Becky literally radiated with joy, and I couldn’t wait to learn more about this strong, encouraging woman. When Becky shared her testimony on the first night of the retreat, I was amazed to learn that she is a single mom of four boys, including a set of triplets—one of whom is severely autistic. Becky’s life has been filled with seemingly insurmountable challenges, yet God has redeemed her story and allowed her to use her own experiences with hardship and pain to touch the lives of countless other women. 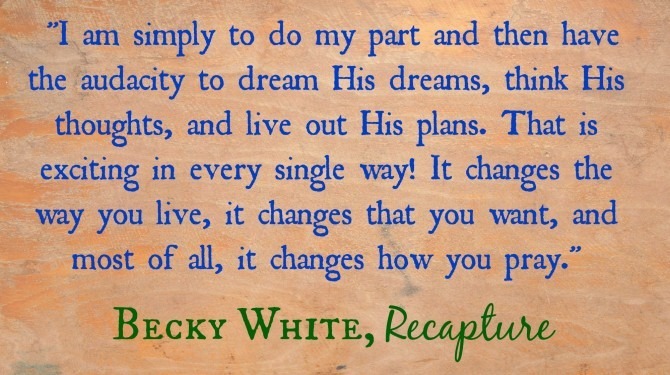 In Recapture, Becky utilizes personal stories and powerful metaphors to bring to life the ancient tale of Ruth. Though most of us are not facing physical famine, like Ruth and Naomi, many of us are experiencing a famine of the heart. The causes may vary—divorce, death, illness, and infertility are just a few that Becky addresses—but the result is the same: we find ourselves deserted and afraid, unwilling to abandon our faith altogether, yet incapable of moving forward. Becky reminds us that we are not alone in our pain, and that God offers us hope if we choose to cling to Him. In fact, though we might not see them as such, these trials are actually a gift from God: pain is one of His most effective instructional tools, and one of His best methods for recapturing our hearts. The journey traveled by Ruth and Naomi is probably not the one they envisioned for themselves, but the story God wrote for them was bigger and grander than anything they could have imagined. Recapture offered the reminder that the same is true for me: as a perfectionist and a bit of a control freak, I have a very clear vision for how I want my life to pan out. Unfortunately, my reality is rarely in line with my expectations. Nevertheless, I can find peace in the fact that God can utilize the broken pieces of my unfulfilled expectations and transform them into something beautiful and better than my limited dreams. He is doing the same for Becky White, and for the numerous other individuals whose stories she shares in her book. And as God rewrites our stories, He recaptures our hearts and draws us to Him. Though this is not a long book, it is insightful and deep, and I took my time reading it so that I could fully digest its powerful messages. As I read, I frequently found myself running for my journal to write down what God was teaching me, and I often stopped my reading to jot down passages to share with people in my life. Recapture is the rare book I can see myself returning to again and again, and one that I will be recommending to numerous friends. The story of Ruth has always held a special place in my heart, and after reading Recapture, it resonates with me more than ever before. My Book Rating: 5 out of 5 stars!